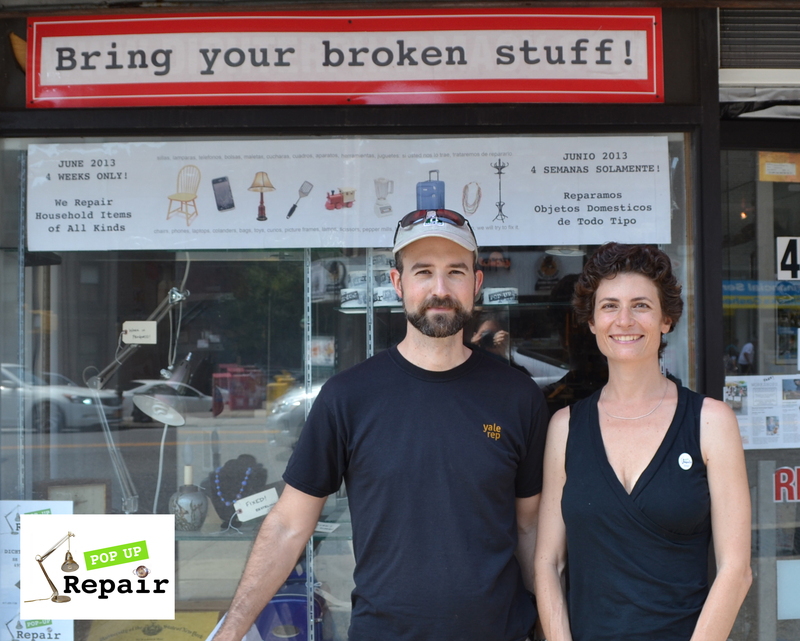 Sandra Goldmark and Michael Banta (pictured above) are bringing repairing to the people of NYC with Pop Up Repair. Look around you, right now, wherever you are. Are you surrounded by designed and built objects? Are you wearing clothes? Do you have a pocket, a bag, a home, filled with things you own? Let’s say you are sitting at home, reading these words. Look around. Pick one object, whatever your eye falls on. Where was it made? Who made it? How did it get into your home (or office, or bag)? How long have you had it? What kind of shape is it in? What will happen to it when you are done with it? I am a theatrical set designer – I create spaces and fill those spaces with stuff. But that’s nothing special – we all do this, every day, all our lives long. We fill our homes, our bags, our worlds with objects we choose (or find, or inherit, or are given). Like a stage designer, we are telling a story with the worlds we create for ourselves. What story do the things around you tell – about you and about the society you are part of? Let’s look at one object – Jacquie Ottman’s Krups coffee maker. Jacquie emailed me a few days ago to ask if I could help her with a leaky coffee maker. When Jacquie tried to use it, she found that “about 2/3rds of the water makes its way through the filter into the pot so part of the water does get through to the coffeemaker while the rest of it seems to leak out from the back. Jacquie, as a waste-hater, had emailed Krups to see about fixing it in NYC. They replied with the names of two repair services, and the suggestion that it might be a dried gasket (the coffee maker is 10 years old). Unfortunately for Jacquie, the two repair shops recommended are in Jamaica, Queens, and Long Island. Jacquie lives in Upper Manhattan. Even for a truly dedicated non-waster like Jacquie, this represents a long trek to repair a coffee maker that can be replaced for between $70 and $200 dollars, depending on the bells and whistles. So, the question remains – buy a new coffee maker, or not? Today, in NYC, a largely plastic and metal small appliance like Jacquie’s can be largely recycled, so perhaps it is not so wasteful to recycle the old coffee maker and get a new one. Unfortunately, making a new coffee maker creates a lot of waste before Jacquie even buys it – as much as 40x as much waste as the weight of the old, leaky machine sent to landfill, according to Annie Leonard. So, the real problem Jacquie faces is not the problem of landfill or recycling – it is the problem of buying new. Buying new goods is resource and energy intensive, and the costs of the process are largely hidden from the consumer, out of sight, far away, and not fully reflected in the price of the new coffee maker. Could Jacquie – or I, or you – even answer some of the questions posed above about story of our stuff? Who made the coffee maker? Where? How long did it take and how much were they paid? The story Jacquie’s coffee maker is telling is the story of a society that is very divorced from the production of almost everything that we own. Look around you. How many of the things you see were made by you? Some? One? None? This is not to say that making your own stuff is necessarily better – we have to face the reality of the world we live in, and all the hours Jacquie might have spent hand-crafting her own coffee maker were almost certainly better spent living the life she actually leads. But what happens when the system surrounding the things we own makes it almost impossible to take care of what we have? And is there a way to change that system? Because let’s face it, Jacquie is almost certainly not going to take her Krups to Jamaica, Queens to be fixed. Since 2013, I have been experimenting with finding an alternative to this system. 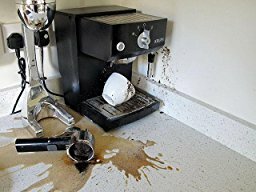 Is there a way to provide a repair service that might make it possible – easy, even – for Jacquie to get her coffee maker fixed in NYC? With my co-founder and husband Michael Banta, and a small group of fellow backstage artists, we started opening repair shops in NYC where people can bring their coffee makers, and also their chairs, lamps, ceramics, jewelry, toys, and more. We are turning the traditional model of repair upside down and inside out, and building a new version that can be part of a sustainable, modern way of life. We have opened 10 short term repair shops in 3 NYC boroughs, and dozens of one-day educational workshops. We have taken in over 2,000 broken items and successfully repaired 85% of them. We charge for our services, and we pay our fixers. We are building a model that looks at repair from the customer’s point of view. Rather than specializing, we provide one-stop drop-off service for a wide range of items. We bring together NYC’s fixers with different specialties, and we have no fixed storefront. Instead, we partner with local businesses and community organizations to provide convenient drop-off locations around the city. We’ve been doing this periodically for three years – and it’s working. I believe that repair, maintenance, and stewardship are a necessary part of any vision for sustainable consumption. Even if we can, some day, switch over to renewable energy, the rate of resource depletion and environmental degradation caused by the way we eat and shop is simply not going to work. And, more importantly, we are not happy with this system, as individuals. Steve Howard, IKEA’s Chief Sustainability Officer said on NPR recently that here in the west we’ve reached ‘peak stuff’. If companies like IKEA are coming to the realization that they can’t continue to expand revenues by selling more, perhaps we have finally reached the point where we can build maintenance, repair – stewardship – into our business models. At Pop Up Repair, we’ve been doing the R&D work for 3 years now, and we can tell you that people want the service, and that there is value to be had. Value for business, value for customers, value for our society, and for the earth. Like repair cafes, we also offer educational workshops – we believe that DIY and drop-off services go hand in hand. It’s like food – sometimes you have time and inclination to cook your own meal, and sometimes you just don’t have the time. But choosing to spend time or money on good food is something we can all understand as critical for our health and happiness, for the individual and for the environment. Choosing to spend time or money on taking care of your stuff is just as important – and can be just as satisfying. Back to the Waste-Hater’s Story — NYC Repair Option Found! 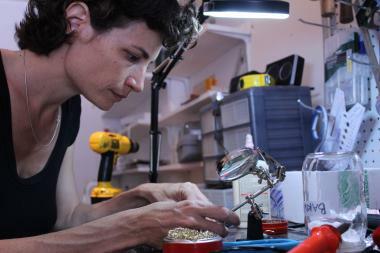 Jacquie took her coffee maker to a friend from the Fixer’s Collective, a local NYC version of a repair café. And if something else breaks in her home soon, she can bring it to our upcoming Pop Up Repair. We’re partnering with some amazing organizations, included Patagonia, GrowNYC, United War Veterans Council, and Dichter Pharmacy to reduce waste, create local jobs, and make it easy for NYC to get stuff fixed. We are what we eat. We are also what we make – and, as modern Americans, that means we are what we buy, what we own, what keep. Making and having stuff is a fundamentally human activity – every culture on earth does it. Look around you. Isn’t it time to find again the value in taking care of what we have? Sandra Goldmark is a designer, teacher, and entrepreneur whose work focusses on innovative and sustainable engagement with material culture. She is an Assistant Professor of Professional Practice and the Director of Sustainability and Environment at Barnard College, and has designed sets and costumes for theatres around the country. 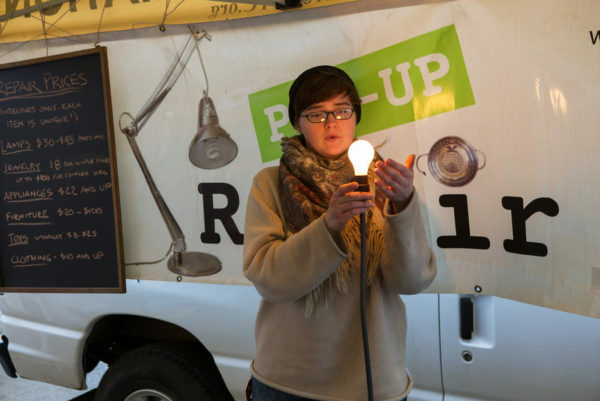 Sandra is also the founder of Pop Up Repair, a social enterprise reinventing repair to create local jobs, reduce waste, and make it easy for people to care for what they have. How do I find a pop-up repair in Manhattan for my espresso maker? I live on the Upper West side. It’s a Saeco Aroma model. Hi Hannah! I’m afraid I don’t know a good location on the Upper West Side, and our next NY Pop Up isn’t for a while. We’ll keep you posted, though, as soon as we have dates and locations! Very nice and informative piece. I strongly relate to the sentiment that we are often “divorced from the production” of what we own. The success of these repair shops is inspiring- especially in our age of convenient disposal and constant updates to products we already own. The term “repair shop” is almost an antiquated concept, though it should not be. We tend to do what is most convenient for us, which is why the location of these repair shops is so important. Overall, I find the idea of building repairs into a company’s business model to be an extremely innovative and impactful idea. Awesome work! This is an amazing idea! It is incredibly frustrating to not know where to go to get an item repaired, and to not know the first thing about repairing it yourself. Your point about the “disconnect between us and the stuff we own” really strikes a chord. The mechanics of so many devices I use on a daily basis are a complete enigma to me, not to mention where they were made or who made them. An educational workshop that teaches simple repairs is such an appealing idea – I would love to attend one! A great piece that presents both a problem and thoughtful steps to achieving a solution! One section that particularly resonated with me was, “but what happens when the system surrounding the things we own makes it almost impossible to take care of what we have? And is there a way to change that system?” As awareness for personal environmental impact increases and consumers become more interested in lengthening their products’ life cycles, companies and third parties must recognize and support them by offering programs like Pop Up Repair and Patagonia’s Worn Wear. Bravo for taking action! I love this idea! Repairing broken goods is definitely a fantastic step towards a more sustainable future. I wonder if this practice would be more effective if there were some kind of service request application rather than a pop-up store. The pop-up stores demonstrate that the demand for these services is clearly there, but perhaps a more permanent solution would make these kinds of repairs a part of New Yorkers’ daily lives rather than a convenient, temporary fix when they happen to hear about one of these shops. Repairing things is the way to go! I have save so may shoes from bringing them to cobblers instead of buying new ones and so many coats with rips by bringing them to the tailor! I love being able to keep my belongings for as long as possible because it builds the story of an item! If I absolutely can not repair something I love finding a replacement at my local thrift store or on craigslist. Thats how I furnished my entire apartment! I love how doing either of these things leaves more items out of the waste stream and reuses items that would otherwise end up in the waste stream. What could be cool is having local repair fairs where people who know how to sew, repair bikes, computers, etc could all get together and repair the neighborhood’s broken items for free or little cost. It would be a great excuse to get everyone together and each everyone about more sustainable living! Wow what a great idea to create pop-up repair shops in NYC for a wide range of items! Where are these shops advertised? I have never heard of them, but I would definitely bring broken items in to be repaired. Is there a website or links that I can share with my NYC-based friends on social media?